Floyd Mayweather Jr. didn’t need to make this transpacific trip. Leonard Ellerbe stressed that point during a recent interview with ESNews. Ellerbe emphasized that Mayweather has made tremendous investments and receives a seven-figure check each month from those revenue sources. The CEO of Mayweather Promotions can’t understand, though, why so many people have criticized the retired five-division champion for accepting an eight-figure appearance fee for his three-round boxing exhibition Monday against Japanese kickboxing star Tenshin Nasukawa. 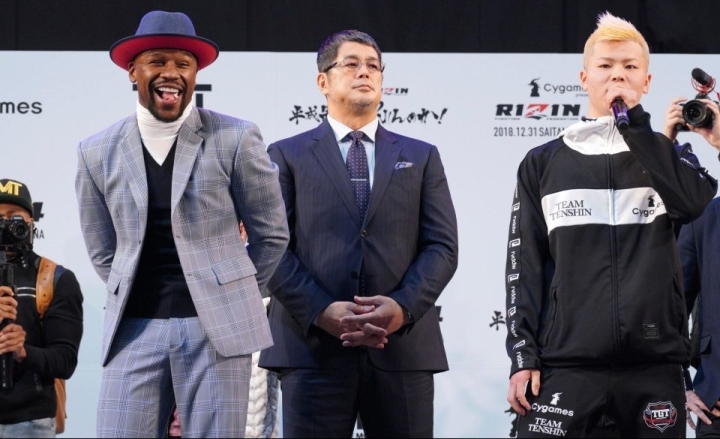 The Mayweather-Nasukawa exhibition, which will take place in Saitama, Japan, won’t be broadcast live in the U.S. It’ll air live in Japan on Fuji TV as part of promoter RIZIN Fighting Federation’s partnership with that influential network. Mayweather, 41, reportedly will be paid handsomely by RIZIN for fighting its 20-year-old star kickboxer/mixed martial artist. The contest won’t count on Mayweather’s record, however, and, seemingly by design, barely has been publicized outside of Japan. This encounter also will mark the first time one of Mayweather’s matches won’t be televised either by HBO or Showtime, or the pay-per-view divisions of those networks, in more than 20 years. Las Vegas’ Mayweather might come out of retirement for a boxing match that counts in 2019, perhaps a rematch with Filipino superstar Manny Pacquiao. That’d require Pacquiao (60-7-2, 39 KOs) to defeat Adrien Broner (33-3-1, 24 KOs, 1 NC) in their January 19 fight for Pacquiao’s WBA world welterweight title at MGM Grand Garden Arena in Las Vegas. For now, Mayweather (50-0, 27 KOs) is focused on out-performing Nasukawa in their exhibition at Saitama Super Arena. “I’m very happy for him,” Ellerbe said, “that he’s in a position to take advantage of these opportunities at this point in his career, because he’s earned that. He’s earned that, and when you get in a situation where you can just go out there and you can just do an exhibition and you can make a substantial amount of money by doing that, hey, that’s a great thing. Photos: Otto Wallin, Jermaine Franklin Set For Fights in A.C.